The new Glow ParaPop 28″ arrived a short time ago from Adorama, and these really are an impressive modifier for using on location. Whether used with portable studio lights like the new Rovelights, Witstro / StreakLights, or with regular speedlites etc. UPDATE – 38″ ParaPops are also now available, as well as optional 28″ and 38″ egg crate grids. The first thing that actually stands out about the ParaPop (other than the really nice build quality), is how incredibly lightweight they are. Especially for a softbox with 12 rods. And apart from that fact that they conveniently pop open and closed quickly, that lightness and ease of handling are likely the biggest advantages of using the ParaPop 28″ as a location modifier. The ParaPop open very easily, I’d even go as far as saying they’re quite fun to snap open. You just pull each rod outwards until they click in place on the speedring. Working your way around the 12 rods only takes a few seconds. To collapse again there are 2 sets of tabs (or buttons) which you squeeze together to release the rods. And ideally you would then be able to quickly open and collapse the softbox in place on a light stand, so they can be easily moved around to a new location and quickly popped open again when needed. Collapsing the softbox is surprisingly where I have actually had a bit of trouble though, as a lot of the time only 6 of the 12 rods will release easily. I found one easy way to release the rods otherwise, is to place the softbox face down on the floor, and press down on the speedring a little which takes some tension off the rods before trying to release them. That way all the rods will release quite easily at once. No tips or instructions are provided for this otherwise. Once released you can then quickly wrap the softbox up with the attached velcro strap. And the important time saver here is that there is no need to mess around with disturbing the front diffuser panels, they can stay in place while the softbox is folded. 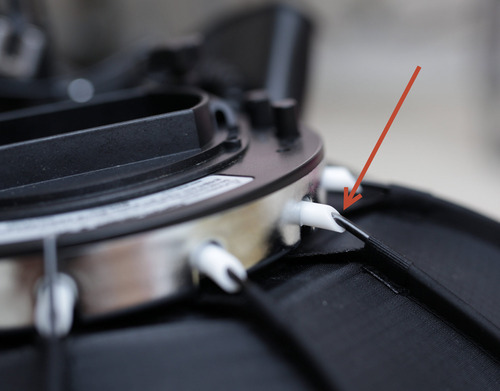 Looking more closely, you can see the triangular metal tabs which hold the rods in place on the speedring. These are spring loaded and retract as you pull a rod into place, and also as you squeeze the release buttons on the back of the speedring to release the rods. Possibly putting a little dry lubricant, or a very small dab of grease on the rod ends would allow them to all release a bit easier. So apart from a bit of a release issue there (easily solved by placing the softbox face down on the floor), the ParaPop are very fast and convenient easy to set up and break down. The inner diffuser panel is also a bit fiddly to remove though. They are nicely attached with press studs, which are very easy to assemble, just a bit fiddly to remove. You really need to get your fingernail in between the press studs to release them, because they haven’t really left a pull tab to release the studs anywhere. So although very secure, it wouldn’t be easy to be adding and removing the inner diffuser in a hurry too often. If switching between one or two diffusion layers quickly on location was really needed, then removing the front diffuser and leaving the inner would likely be the best option. The ParaPop are available with either a speedlite bracket, or with a speedring insert for attaching the ParaPop directly to studio lights. There are speedring inserts available for Bowens, Elinchom, Alien Bees, and the FlashPoint mount. The inserts are available a little cheaper with the ParaPop, or sold separately for $35. These inserts are again extremely lightweight, and made of relatively thin plastic. The ParaPop itself is very lightweight though, so the inserts are still well in proportion, and easily strong enough to support the softbox. And they do feel pretty sturdy still overall. Even more telling are the 3 extremely small screws used to attach the inserts (or speedlite bracket) to the ParaPop. I literally had to use a small watchmakers screwdriver to remove these, as the smallest regular screwdriver was still too large to fit. Again with the light weight of the ParaPop, these tiny screws still appear to do the job fine. Mounting to the FlashPoint Rovelight using the Bowens mount is a pretty loose fit due to the RoveLight’s fairly loose mount. They can’t come apart though so that is not really a practical issue. Otherwise the ParaPop combine nicely with studio lights. As seen in the image above though, there is a caution of an 80 degrees Celsius heat limit though, so care may need to be taken with modelling or continuous hot lights etc. The ParaPop 28″ and Godox Witstro or FlashPoint StreakLights are a really nice combination. As they are equally lightweight, and the forward facing flash with no obstructions in front of the flash tube make the most out of the limited (though still very capable) power of the Witstro. Using a single diffuser with the ParaPop provides at least a stop more light than the Photix Luna, or Westcott Apollo’s. An Ezybox can provide similar results, though the ParaPop’s nice shape is still a little more efficient and even. And the ParaPop are generally a nicer modifier to manage and handle than an Ezybox of this size. The speedlight bracket provided with the ParaPop kit is again very light weight. And although they were likely designed for the original smaller softboxes and speedlites, they will still support the 28″ ParaPop and Witsro units quite fine as well (using the flat flash base if using the larger 360 flash). If you would like to switch between Bowens or Elinchrom mount studio lights and the Witstro or Speedlites, the Godox S-Type brackets for Bowens and Elinchrom are a great alternative though. The inexpensive plastic Godox bracket is absolutely built like a tank in comparison the the original ParaPop bracket. They do then add a little weight, though the flash head clamping mount is great, and having the more sturdy overall mount is nice as well. It would take a little DIY, but if using only Witstro and speedlites with the ParaPop 28″, I would personally screw the Godox bracket directly to the ParaPop. This would take some filing of the Godox bracket, though its only made of plastic so that wouldn’t be hard. If you don’t like the thought of DIY though, just using a Bowen’s or Elinchrom insert and the Godox bracket is still fine as well. As is using the original ParaPop speedlite bracket. Because the ParaPop speedring has a fairly small opening, and a nice shape to it, there is really not much need for any extra reflector collar around the Witstro flash tube. Adding a small collar around the bulb did not really make any difference in flash output, as the ParaPop speedring shape is already quite a good design. Using the Godox umbrella reflector could possible add a little more light, though it may create a little more of a center hotspot then as well. There are also SMDV-03 adapters available to attach the sotbox directly to the the Witstro flash head. Though even as light as the ParaPop is, I personally wouldn’t want to risk damaging the flash head or mount by mounting like that. Even with the Godox S-Type brackets above, its a good ideal to try an resist clamping the flash head in too tight. Because if a stand goes over, the flash can then at least move a little in the bracket, providing some shock absorption rather than actually breaking the flash. Again being very light weight, and efficient the with the flash facing directly at the front diffuser, the ParaPop are a great combination with speedlites. The only downside is possibly the lack of ability to mount (or fit) more than one speedlite. If in need of more power though, that is where the Witsro above would really need to be used instead. The original ParaPop speedlite bracket is also very light, and because of that likely the best option if you want to travel really light, or possibly often hand hold the ParaPop in one hand while shooting with the other. For combining speedlites and studio lights with the Bowens mount, the Phottix HS Speed Mount II are another nice option though. These are all metal, so very sturdy, though the main thing I like over the Bowens mount Godox brackets above is that the mount is a really nice neat fit. So the softbox doesn’t rattle around like it does on the Godox bracket. The Phottix bracket are also handy for other speedlite mounting options, though they won’t mount the Witstro units without some modifications. The ParaPop are very well made, and there is nothing cheap about the materials. The diffuser fabrics are nice quality, as is the main softbox fabric. That doesn’t let any light through as some other lightweight softbox materials often do. 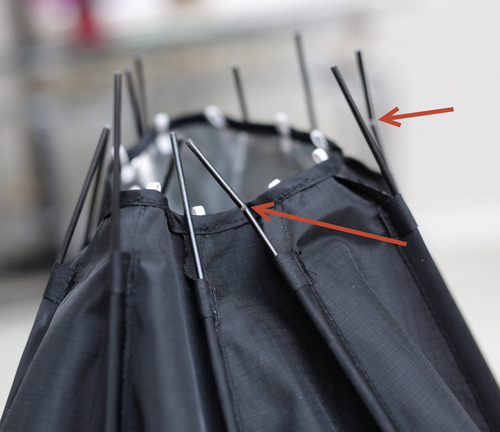 The rod ends even have relatively large and nicely machined alloy tips, unlike some of the nasty sharp tips you find on even some higher end umbrellas. The rods themselves are fairly flexible and appear to be quite durable. I’m not sure how easily the ParaPop would be damaged if a light stand did go over. Though having quite a number of reasonably flexible rods, there is a chance they may just spring to absorb a lot of the impact. And the rods will likely be available separately, as they are already for the smaller versions. Durability of the speedring mechanism itself is the other main thing I have been a little unsure about. Though the ParaPop are based on the SMDV diffusers which have been available for a few years now in the smaller versions, and some time now in the 28″ version as well, and I have not heard any complaints yet with those. That is good sign, and this is where the support from Adorama becomes valuable as well. So its great to have this Adorama Glow branded option available now. The ParaPop is also finished off nicely with a very practical padded case with shoulder strap and carry handles. Again the case is very lightweight, and will fit the ParaPop and bracket fine. The ParaPop 28″ are certainly one of the nicest snap open location modifiers currently available, and definitely worth considering. Other than the relatively high price, the only main limitations are for multiple speedlite mounting, and currently the lack of a grid option (though it wouldn’t really be too hard to make one fit if needed). And possibly some heat limitations. The ParaPop are a very lightweight design, and there is a lot of plastic in the speedring mechanism. Though this light weight is one of their biggest advantages, and combined with the great snap open action, they really are enjoyable to use. This post has mainly been about the practical side of using and mounting the ParaPop, as that is the main advantage of a fast set up location modifier. Though the light quality is as even, if not better than similar regular softboxes, and very efficient for speedlites etc when needed as well. I will try and put together some direct comparisons with a number of modifiers together eventually. Nice but to expensive with 450 USD (shipping + duties) for me. Have a look at foto-morgen.de. Great review! I will receive mine in a few days. This should be a nice match for my ES600P also as it’s lightweight and I assume should easily mount to the small head. Thanks, yes these should be a great match with the RS600P and even the Quadra. You will easily be able to hand hold these with the RS600P as they are both very light. Yes, up to now I’ve been using the ES600P with Apollo style boxes due to the weak plastic head of the older ES version (as opposed to the beefier RS600P). This should solve that issue I hope. Pretty cool.it sounds I like the ones from SMDV.maybe you can check them out.They’re Basically the same but they got a good variety of sizes and mount options too. I got the 50mm one and I love it.it got the same snap system as the parapop. I’m thinking too get the 70 or even 90cm version next. As always you’re doing a great job! Love your blog and I recommend it to my friends! These are the SMDV ones just rebranded for Adorama. Didn’t know they have a 90cm version. Where did you see that? Doesn’t look like that Adorama is carrying the 80/90cm versions yet though. Thanks for that. The 90cm version would be fantastic as well. Nice review and good tip on collapsing the softbox. I ran into the same issue of having roughly 6 of these fiberglass rods not releasing correctly. The fiberglass rods are not all that durable. The box came with some extra rods, but I had to purchase some replacement rods already because 6, yes 6, of mine have already broke. Thanks for that. How recently did you purchase your softbox? I’m just wondering if they may not have updated the rods by now if there was an issue. I didn’t receive any spare rods. Thanks. I bought the SMDV version of this box on Amazon.com back in March. The Adorama’s version comes with a 2 years warranty, and I think Adorama would be more willing to send you some replacement rods. For me, the US distributor charged me $5 per rod. That’s hilarious dude, because I bought the SDMV 70 as well back in December and have broke 2 rods ONLY because my light stand dropped the box flat on to the cement (my fault). The rods are actually pretty sturdy, and have survived drops from light stand drops… what kind of abuse do you put the diffuser though? Nice Review i use this modifier and love it!! can´t wait to have the 90 cm version! Yes the 90cm version would be spot on! I have used mine and it’s a nice modifier. Love the lightweight and how it pops open. The major shortcoming is how it collapses. As mentioned above only half of it closes almost all the time (thanks for the tip Elv! it helps.). The other minor issue is the carrying bag. It’s such a tight fit that after replacing the stock adapter with the Bowen’s version it no longer fits in the bag. That’s poor design. Recently I replaced the original bracket with the Godox S-type for Bowens. The modification was successful and was able to use seven of the eight supporting screws. I am very satisfied to fill how tight the diffuser base is now. However, my joy turns to sadness because my Wistro AD360 is off centered when fitted in the S-type bracket. One solution would be to remove the accessories holder screw or the knob, allowing the flash to be moved to the side to center it. I am wondering if that will void Mfg. warranty. Any ideas on how to solve this successfully? Love the Glow!!! Any hints as to whether the 90cm version will be sold under the Glow/Parapop/adorama brand and in a flashpoint mount? I’ve been told that the SMDV version will hit the market in a month or so. The Glow ParaPop 38″ should be available in around 6 weeks. That size is not shown on the SMDV website, though they are the Diffuser 95 (cm). They should be around $259.95 with a speedring ($249.95 with regular speedlite bracket). Around 100cm is an ideal size to still be easily manageable outdoors, so they should be excellent. Interesting. Any thoughts on how one would mount a Quadra to one? If you have the Elinchrom adaptor for EL reflectors, then you would just need the ParaPop with the Elinchrom speedring mount. The ParaPop is very light though, so you could mount it directly to the Quadra head if you did a bit of DIY. If you panel beat a regular Quadra reflector flat, you could then screw that straight to the back of the ParaPop. There is a flat reflector / mount pictured here for the Ezybox, though I don’t know where they are available from (likely from Lastolite at a price). What would be your recommendation for a soft box. I purchased four newer 850 (Godox) after reading your recommendations and have a 24 cheetah soft box . I’m looking for soft boxes for other lights , which are not very expensive. What are your recommendations for strip lights. I’m sure there are many products in markets , but any recommendations based on your experience will be appreciated. Got the 20 inch Hexapop last year and love it! So just got a 28 inch and a Wistro 360 to match. If that works out the 38 incher is next. (at Ado now xmas 2014). I put some teflon lube on the 12 teeth holding the rods and they felt just hair smoother to open. But… still only six rods released! Rats! We are the authorized SMDV distributor/dealer in the U.S.
As you noted, Adorama’s Parapop is a licensed version of SMDV’s Speedbox-70 softbox. There are some minor differences (e.g., SMDV uses higher quality outer fabric). But they both use SMDV’s patented speedring. One thing I would like to note is your mention of SMDV DA-03 adapter for use with this softbox. SMDV does not recommend it. DA-03 adapter is recommended for smaller models, i.e., 40, 50, 60, and the 65. SMDV believes DA-03, although it can be used with Speedbox-70, isn’t the most stable combination. Also, Speedbox-80 and -90 are currently available in either Bowens or Profoto mount. Nice to hear from you, and looking forward to the Speedbox 90. Regarding the DA-03 adapter, as mentioned in the post, I’m personally pretty wary of using this with any of the softboxes except possibly the smallest one, as its always some risk of damaging the Witstro flash head if knocked about. Some people have used the DA-03 in combination with the original speedlight bracket that comes with the Speedboxes, which is a more secure alternative. Though that takes a little DIY to attach the DA-03 and speedlite bracket to the softbox speedring at the same time. Just wanted to share some info with you since you expressed concern about using the DA-03 adapter. So, I feel comfortable usind DA-03 up to Speedbox-60 and -55. And that’s the way I use Speedbox-47 and -55 with Godox Wistro flash. Its not only the weight that is the issue though. The larger softboxes have considerably more leverage, and also larger surface area to catch the wind etc, or even just get knocked around more easily. I can see that they would work quite well together, and there may not be any big risk. Though at the same time I have had numerous people asking where they can get their flash head fixed, or get parts to fix them, and the problem is they are not available. So its something to keep in mind. Anybody tried these? Looks like a similar design but much more affordable. Any clues about profoto mounts? I saw one from flashpoint that supposedly compatible with profoto but it has no clamp, adorama sells it. Sorry no I’m not sure about Profoto. You could try contacting SMDV, or possibly Jay above if you are in the USA. If you’re a bit handy though I think you could take the center insert from a Profoto speedring and just screw that directly to the softbox speedring. Another thing to note is that there is a small gap where the rods meet the speedring mechanism, which means there’s a bit of light blowing out of the gaps. There’s enough there that if you were shooting in a dark studio you may want to throw some black wrap on that area to contain it. I saw the interest in the 80cm and 90cm version of this softbox. We currently have some limited number of SMDV Speedbox-80 and -90 in stock on our website. All in Bowens mount. Dds you put together some direct comparisons with a number of modifiers together? Would be nice to see light spray and output power level. Thanks. Thanks for the review and tip on how to overcome a stubborn release. Using a 28 & 38 on location, it was discomforting that I couldn’t collapse and store for transport. I found your site while looking for a solution. Thanks. Is this still a great softbox these days given this initial review was written almost four years ago? Looking for a Bowens mount octa for my AD 600 Pro and AD200 setup and this one is high on my list of considerations but it is pricey, especially for shipments to Canada. A lot of cheaper umbrella frame softboxes are just becoming available now (I think the original patent may have expired), though the ParaPop and SMDV have still not been matched by anything I’m aware of in terms of efficiency, light weight, and the way they open / close without needing to remove diffuser panels. The umbrella frame boxes can produce slightly softer light if a beauty dish like reflector is also used (at the cost of light output). And they will likely be available in a lot more shapes and sizes. I think the SMDV and ParaPop are still at the top of the game for what they do though. Very efficient with the AD200 and 600 Pro.